HomeGet OutdoorsDay TripsIn Gaylord, When the temperature drops,and the snow flies, things really heat up. 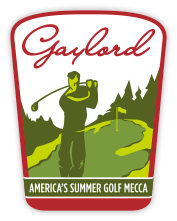 In Gaylord, when the temperature drops and the snow flies, things really heat up. Don’t just walk in our winter wonderland. Ski it, float it, fish it, sled it and sail downhill on it. 1 Make plans to attend Michigan’s Richest Snowmobile Fun Run on Feb. 23. 2 Truly enjoy winter at Gaylord’s Annual Alpenfrost – Frosty 5K, carriage rides and other winter fun. 3 Float the not-so-frozen Sturgeon River in a raft. Sturgeon River Paddlesports or Big Bear Adventures. 4 Check in with winter wildlife at Aspen Park. Thanks to the white background, photographing the elk and beaver pond is never better. Take Otsego Avenue south to Commerce Boulevard’s end. 5 Nab a 55-minute pass for some extreme tubing at Treetops Resort. 6 Shout “Woo-woo-woo!” all the way to Mackinaw City as you snowmobile the former North Central Michigan Railroad Corridor. 7 Snowshoe along the Sturgeon River in the super secluded, super quiet, no snowmobiles allowed Green Timbers section of the Pigeon River Country State Forest. 8 Get to the trails…cross country style! Whether a beginner or expert, you’ll find miles of trails to suit your taste. 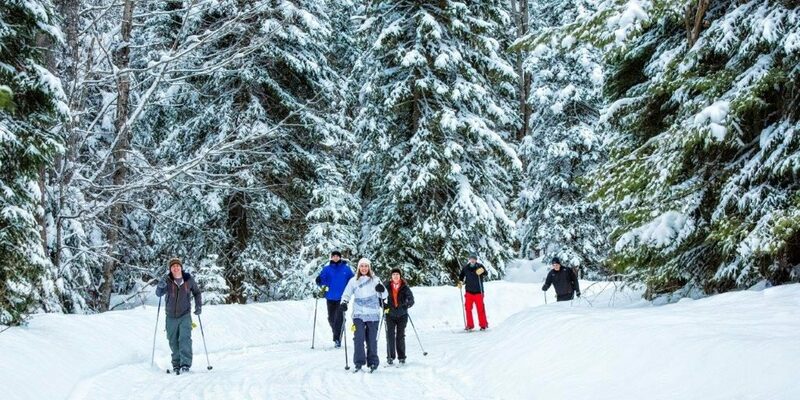 Boasting over 180 inches of annual snowfall and heavily wooded rolling terrain, the Gaylord area offers some of the most enjoyable and challenging cross country skiing in Michigan. 9 Are you an angler that can’t get enough? Cut a hole in the hard stuff and start a great Gaylord winter tradition — drop a line and do some ice fishing on one of the many lakes in Otsego County! 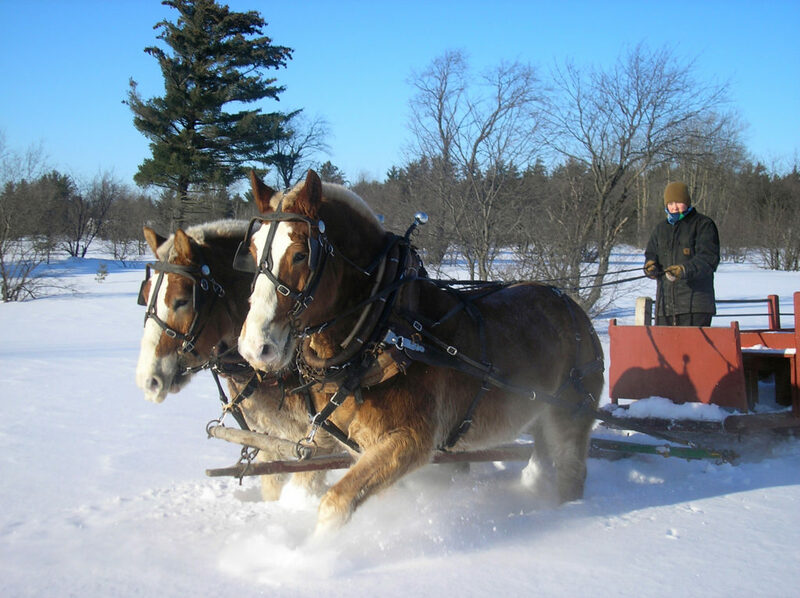 10 Ride the old fashioned way—in a horse-drawn open sleigh—at the Cook Family Farm. Afterward, warm up inside with hot cocoa. Don’t forget to browse the shop for even more homemade goodness: syrup, jams, jellies, honey, eggs, natural meats and soy candles. The best-kept dining secrets for a snow day indulgence. The hottest place to be on a cold Friday night? Michaywé Inn the Woods—home of the best fish fry in town. 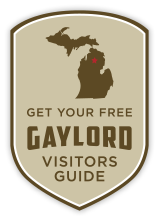 This Gaylord gem features lighter fare, a full bar, the freshest seafood, perfectly prepared steaks and pasta, along with a pristine view of Lake Michaywé. Best of all? Patrons can take home a six-pack with their homemade pizza. There’s good reason this cozy, casual, fireplace-warmed restaurant at Treetops Resort is a favorite among skiers—and it’s not just the scenic view of the slope. Rich beginnings, hearty entrees, signature desserts and over 60 different types of beers from around the globe are all what makes this casual eatery a legend among locals. Minutes from downtown, yet culinarily a world away, Otsego Resort’s Duck Blind Grille is the perfect place to cozy up with comfort food creations like lobster mac-n-cheese, dry-aged filet mignon with horseradish mashed potatoes, or the crispy calamari with sweet Thai chili sauce and wasabi mayo. All this is supplemented with a stellar wine list. 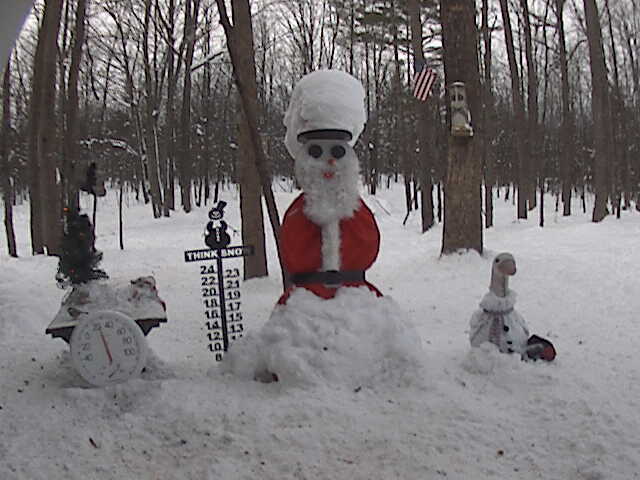 Snow junkies can scope out the fluffy stuff in Gaylord 24 hours a day on snowmancam.com, a live feed from a snowbelt backyard that shows the snow as it falls. The weatherman is a snowman. The measurement tools are a dial thermometer and a decorative snow ruler. And, you can donate dollars to feed the wildlife that pass into the frame. Past visitors include black bear, deer, porcupines, raccoons, wild turkey, squirrels, birds and more. Pine Cone Rentals offers rental houses big and small around the Gaylord region, many of which sit smack dab alongside area XC ski trails. One favorite setting? Around Michaywé’s Pines Course, where 17k await. Party of two? Or just a big party? Beaver Creek Resort can accommodate your crew in cozy cabins with direct access to hundreds of miles of groomed snowmobile trails. More convenient yet, guests can rent a sled on site. Be sure to check our snowmobile trail report before heading out! Treetops Resort’s recently renovated lodging includes hotel rooms and efficiency units with kitchenettes, sprawling across their immaculate grounds. Otsego Resort boasts a mix of hotel rooms and condo units with kitchenettes, and they sit mountainside, giving you immediate out-the-door access to exceptional downhill runs. Looking for a Winter Adventure? Whatever the season, you’re in for a good time on the Sturgeon River. Located just a hop, skip or a short ride north of Gaylord, the Lower Peninsula’s fastest flowing river offers a winter experience you won’t soon forget! Hop aboard for a DRY, guided winter rafting trip beneath the snow-covered evergreens. Check out Big Bear Adventures or Sturgeon River Paddlesports.